Access to Global Online Research in Agriculture (AGORA) team is pleased to inform you that the Research4Life programmes - including AGORA - will receive a new authentication system on 4 July 2017! The link to access AGORA login will change with the new system. As you may already know, to access resources through the AGORA programme, a login is required. The link to the authentication page will be changed with the implementation of the new Research4Life authentication system on 4 July. set up a redirect for anyone with bookmarks or for sites where the link is not yet updated, an attempt to connect to the old link will be redirected to the new link. 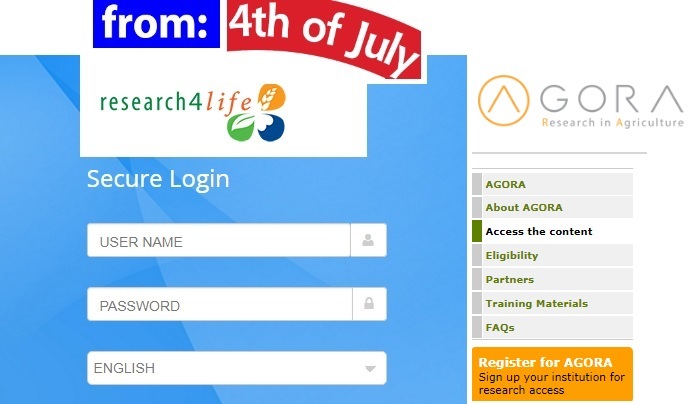 As the new Research4Life authentication system will be rolled out to all Research4Life databases with a “one-tap authentication”, AGORA users will be able to search and browse content from all Research4Life programmes (they are registered to*) - with one login ! AGORA team will be pleased to assist you!